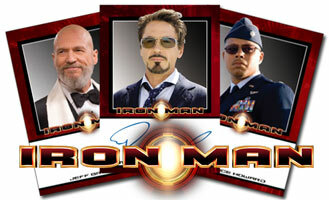 Every Iron Man Movie card box includes 2 Autograph, Sketch, and/or Costume cards. Autograph cards include Robert Downey Jr., Terrence Howard, Jeff Bridges, Faran Tahir, Jon Favreau, and more! Costume cards include items worn by Robert Downey Jr., Gwyneth Paltrow (Pepper Potts), Jeff Bridges (Obadiah Stane), and Terrence Howard (Col. Rhodes). Sketch cards will include movie sketches as well as comic book sketches from actual Iron Man comic book artists (Brian Denham, Emir Ribeiro, Harvey Tolibao, Cat Staggs, and others). Bonus cards include Iron Man Archives cards (key moments from "Tales of Suspense"), Casting Call cards (featuring the cast of Iron Man), and Armored Hero (featuring Iron Man in action). A case topper card signed by Iron Man co-creator Larry Leiber is inserted one per case. 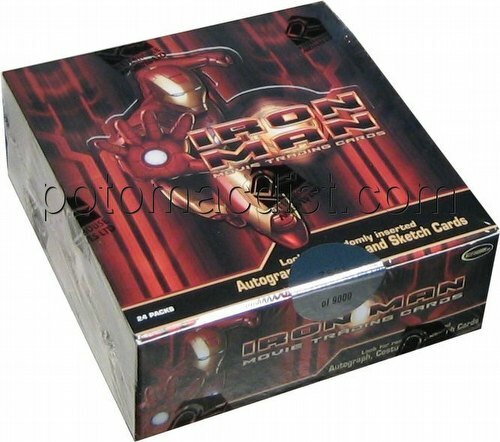 Customers pre-ordering 24 boxes (2 cases) receive an Iron Man armor prop card. 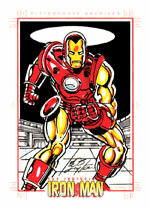 Customers pre-ordering 48 boxes (4 cases) receive a hand-drawn sketch card by Iron Man artist Bob Layton.